Interactive customizable/brandable magic glass touch-screen interface, hi-resolution DSLR camera, powerful computer, innovative professional photo booth software. The original “Mirror Me™ Magic Mirror Photo Booth is a stylish and ornately framed 5-foot tall gold-relief mirror with an amazing special magic glass touch-screen interface, hiding a hi-resolution DSLR camera and a powerful computer with innovative professional photo booth software that makes social media and email sharing, GIF animation, real video, green screen, and other customization’s possible. Interactive Fully-Customization Magic Mirror Photo Booth Will Be the “Absolute Biggest Hit at Your Event! The Magic Mirror Photo Booth is SUPER POPULAR and designed to be aesthetically beautiful to enhance fashion, art and media events or parties where style is the theme. 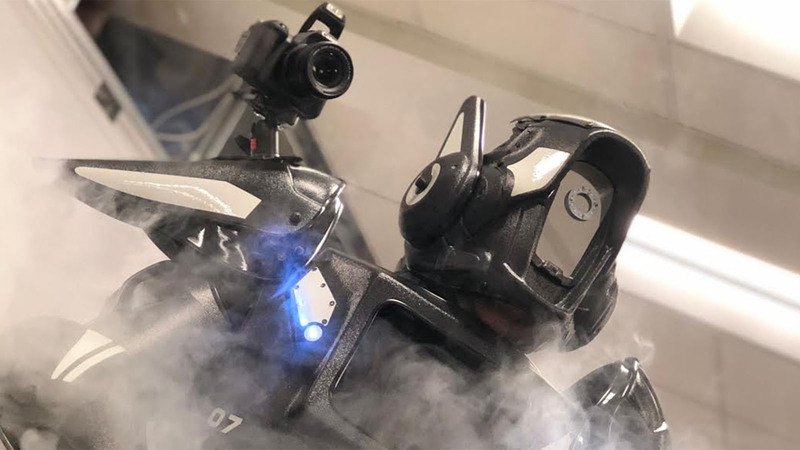 This photo experience for parties has quickly become the exciting ultra-popular “go-to event accessory” for stylish weddings, Bar/Bat Mitzvahs and higher-profile corporate events. Guests love the instant gratification of (theme-specific or branded) physical prints as fun momentos. The ability to share the “selfies/groupies” on social media and email ensures everyone (and their friends) can see the fun guests are having at your event (with branding). Guests were first attracted to the large and elaborate gold-framed mirror, as they approached they were greeted by voice and with colorful animations creating a magical, interactive “selfie” experience resulting in photo keepsakes. When walking into the party, guests are unlikely to miss a 5-foot tall gold mirror, especially when there’s a group of guests clearly excited and buzzing. Most are suprised to find that the Magic Mirror is actually a photo booth and complete professional photo shoot installation. Guests are immediately fascinated and then drawn-in by the colorful (customizable) animations and professional voice guidance. The easy-to-use intuitive touch screen helps them have fun and guide their own experience as the Magic Mirror “magic glass” comes-to-life to interact with the guests. And look, there’s a table with custom props and hastags and silly hats, funny glasses, feathered boa’s, and more. Magic Mirror Photo Booth installation include two highly-trained photo booth attendants (PBA’s) that will manage every component of the photo booth installation and the guests photo booth experience during the event. The PBA’s are there to cheerfully answer guests questions and to make sure everything goes safely and smoothly and ensuring everyone has a great time. The Magic Mirror is the official FotoMaster Mirror Me product, not a cheap copy. This interactive exciting photo-technology wonder takes your guests experience at your event to a new level, with options including: voice guidance, vibrant animations, touch based photo-signing, emoji stamping, interactive contests, social games, colorful photo countdowns and more. One of the most popular features of the Magic Mirror Photo Booth is the ability to customize and share media (images, video, audio and Animated GIFs) by email or (even better) Facebook, Twitter and Instagram. The Magic Mirror Photo Booth is the exciting choice for branding and sharing experiences from high- profile corporate events and trade shows. And your wedding reception guests will absolutely love the email sharing option to share the important event with the important family members and friends that could not attend. Hurry, these popular types of photo booth are usually reserved well-ahead of events! Call (800) 229-7278 / (800) A2Z PARTY | 7-days a week (9 am – 9 pm). 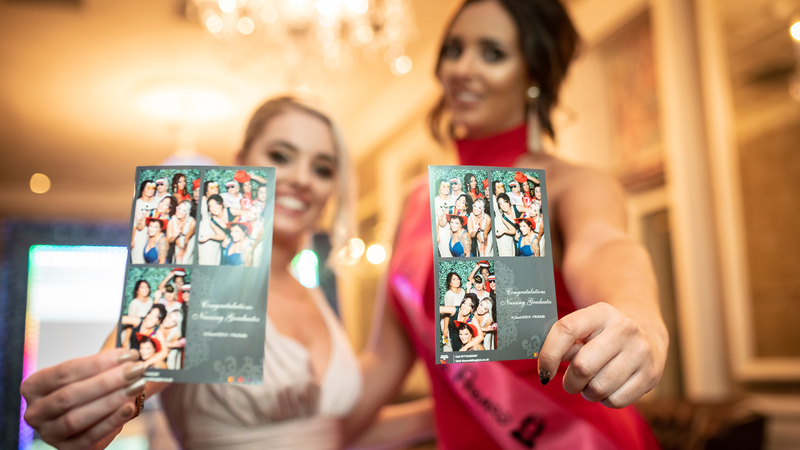 The 212 PHOTO BOOTH design team can also create custom branded graphical user-flows or make available a wider array of add-on features to include in the interactive Wedding Photo Booth or Corporate Event photo installation. Consider voice guidance, gesture and movement detection, or entertain and brand to guests with colorful bright animations displayed on the mirror user-flow. The touch screen can be used for photo-signing or colorful and fully customizable emoji stamping. Take your own chances with a “Screaming Contest”. Guests can play social games. And we can create a custom colorful photo countdown from your images. 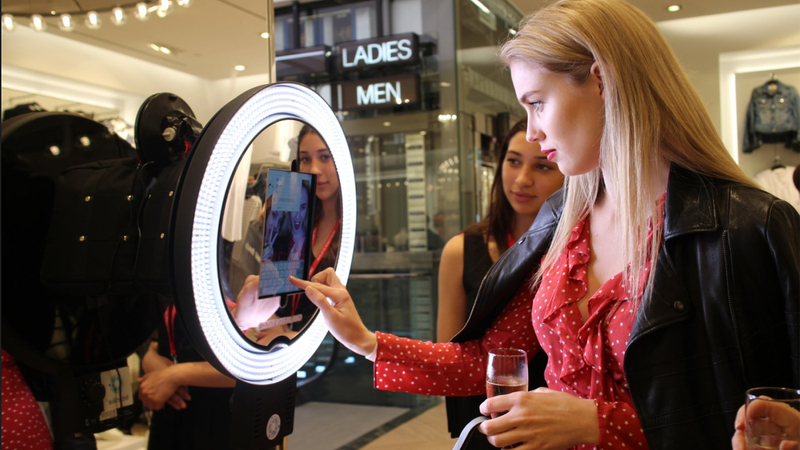 The Magic Mirror Photo Booth hardware and technology is modern and powerful but it’s also easy and fun for the guests to use. The interactive visual or audio presentation attracts attention and gets the photo booth event rental attraction noticed. The Magic Mirror Photo Booth is 5 feet (60″) tall x 3 feet (36″) wide x 2 feet (24″) deep. There is a secure case for transport with handles on the top, sides, and bottom and wheels on the right and back sides. The equipment requires a minimum of two (2) trained team members for any installation. With children’s animations we offer the interactive photo booth for a kid’s birthday party, children’s carnival or charity event. Children can enjoy the magic of the Magic Mirror Photo Booth rental and interact with lively age-appropriate animations while getting an memorable printed photo keepsake from the event that can also be shared on social media. Our design team can design and load custom and branded animations that are fully personalized for the event. The animations might feature the married couple at a wedding or branded animations that emphasize the corporate image or event theme. The potential of this dynamic feature is virtually unlimited. Your custom static images are supported too. Guests will enjoy personalizing their keepsake photo prints with this unique and interactive photo booth print signing & stamping feature. When the Signature feature is included in a workflow, guests will have the ability to draw or sign their name directly on the mirror, which will then be printed out on the final image.